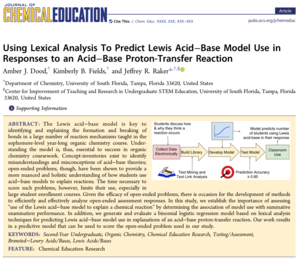 Amber J. Dood has published work on using lexical analysis and a logistic regression to predict the use of Lewis acid-base model use in written explanations of a single proton transfer reaction. Abstract: "The Lewis acid–base model is key to identifying and explaining the formation and breaking of bonds in a large number of reaction mechanisms taught in the sophomore-level year-long organic chemistry course. Understanding the model is, thus, essential to success in organic chemistry coursework. Concept-inventories exist to identify misunderstandings and misconceptions of acid–base theories; open-ended problems, though, have been shown to provide a more nuanced and holistic understanding of how students use acid–base models to explain reactions. The time necessary to score such problems, however, limits their use, especially in large student enrollment courses. Given the efficacy of open-ended problems, there is occasion for the development of methods to efficiently and effectively analyze open-ended assessment responses. In this study, we establish the importance of assessing use of the Lewis acid–base model to explain a chemical reaction” by determining the association of model use with summative examination performance. In addition, we generate and evaluate a binomial logistic regression model based on lexical analysis techniques for predicting Lewis acid–base model use in explanations of an acid–base proton-transfer reaction. Our work results in a predictive model that can be used to score the open-ended problem used in our study."